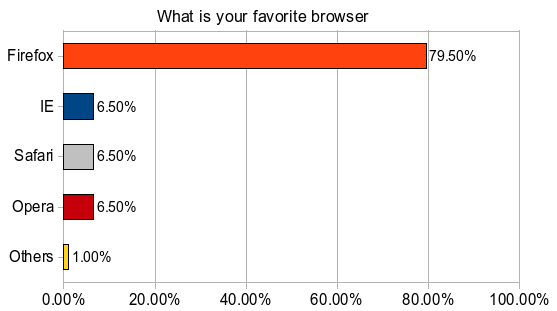 [Poll Result]: What Is Your Favorite Browser? Here is the result of a recent poll in MakeTechEasier (MTE). This result seems a bit of a surprise when the statistics taken from W3C shows that (in Dec 2007) Firefox users only account for 36.3% while IE users (inclusive of IE5, IE6 and IE7) take up 55.9% of the market share. To investigate the statistics further, I look at the analytical statistics for few of my sites. For MakeTechEasier, 81.83% of the visitors are Firefox users while 14.5% use IE. This result matches that from the poll. For my other non-tech sites, the result is similar to the W3C statistics, with 60% of IE users and 32% of Firefox users. So, can I conclude that geeks (or people with technical knowledge) use Firefox while the rest use IE and other browsers? I agree that the percentage of firefox users is just not 80% in general. For my site firefox hangs around 20%. I guess it’s just a matter of people not knowing what they are missing out on. I’m a big advocate in converting people to FF, but I guess that’s mainly because I hate having to constantly add hacks and tricks in my CSS to counter IE’s shortcomings.